At 22 years of age, Pius Heinz is another of the Internet´s “young guns” making a name for themselves in live poker tournaments. The Cologne based player is the first German ever to reach a WSOP Main Event final table, having successfully made the transition from online poker (Pius won a FTP Sunday Mulligan in 2010 and a PokerStars $150K tournament in 2011) and, in his visit ever visit to Las Vegas, finished in 7th in the $1,500 WSOP NLHE “Donkament” before making the final table in the Main Event. 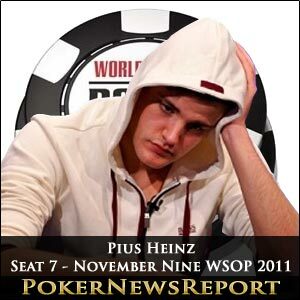 Pius Heinz had started Day 8 of the WSOP Main Event closer to the bottom of the leaderboard than the top, but doubled up when eliminating Sam Barnhart in seventeenth and then was the chief tormentor of the very dangerous Andrey Pateychuk – first flopping two pairs in a 6 million chip pot, and then eliminating the subsequent EPT San Remo Main Event champion when his J♠ J♥ held on against Pateychuk´s A♣ Q♠. At one point, Pius´ chip stack was over 25 million, but three major losses against John Hewitt put the German below 10 million. His tournament looked all over when he shoved his last 8 million chips with K♣ J♣ against Hewitt´s A♥ K♠, but the 9♦ on the river gave Pius a gutshot draw to enable him to double up and eventually qualify for the final table in seventh position with 16,425,000 chips. What´s Pius Been Doing Since? Pius´ next public appearance was the EPT Barcelona where, in only his second live tournament series, he took down the €1,000 NLHE Bounty event for €17,450. He is also seen a lot on PokerStars under his pseudonym of MastaP89, where he has been competing in many of the higher buy-in multi-table poker tournaments – particularly doing well in the Turbo feature tournaments. No major sponsorship has been announced, so it will be interesting to see if he is wearing any patches on his trademark white hoodie come Sunday. Opinion is divided on whether his style of playing will enable Pius to survive the first day of the final table. As both the better stacked Ben Lamb and chip leader Martin Staszko have position on him, Pius is not going to get away with the three and four bet strategy that worked against Andrey Pateychuk and there are a couple of other players who are capable of running down his stack – as John Hewitt did. Nonetheless, if Pius is able to double up early on Sunday, he could potentially be among the final three on Tuesday, but it is a big “If”. Check our full list of November Nine players here.